As I’ve mentioned before, I started Eli on a hybrid of BLW. 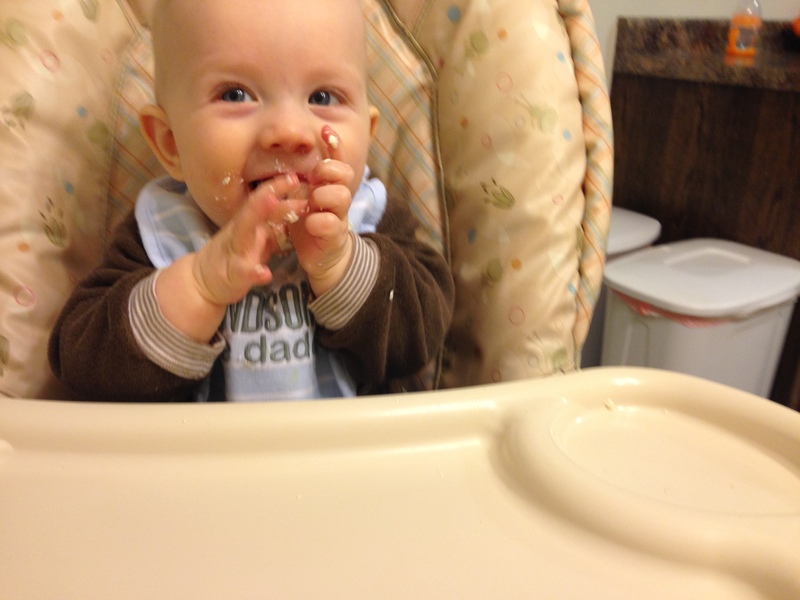 I have a little issue with messes, so baby cereal wasn’t really on my radar for a BLW item. While he was getting some red meat and spinach, his iron intake was pretty minimal. I am breastfeeding, so by 6 months he really needed an iron supplement. I did introduce some spoon-fed iron-fortified cereal, but there were so many other real foods I wanted to give him, that I decided to get him an iron supplement. 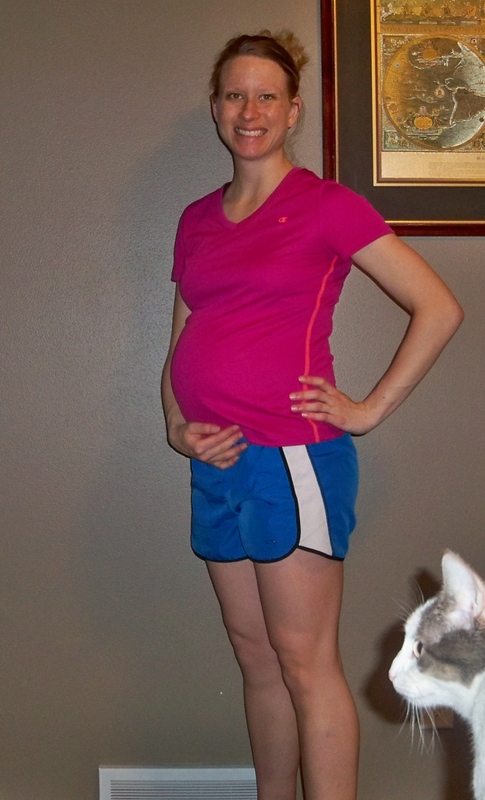 Well, until he tried the supplement – and proceeded to vomit it everywhere (and stain his cute PJs). So, back to the iron cereal, right? Wrong. Turns out I can’t make it thick enough for him anymore – if it’s thin, he gets mad he can’t chew it and just plays with it in his mouth, spitting out most of it. And he’s started to grab the spoon to feed himself. Which works great when something solid is on the spoon, but not so great when it’s a runny mess. 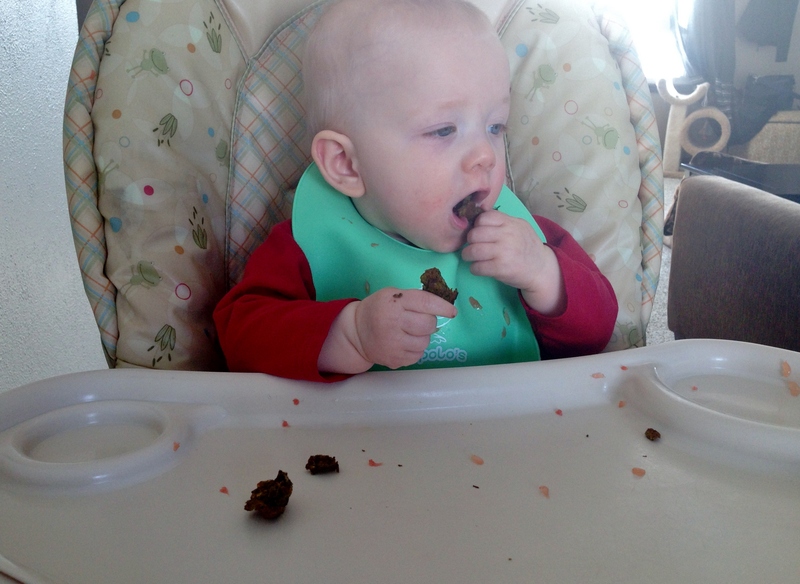 But then it hit me – make infant cereal muffins. I did a little search and there are a few people out there who have done it already, but none of them put iron supplement in theirs. I asked an RD friend who confirmed I could cook with the supplement, so I was set. The end result – nothing you’d buy in the store, but perfect for Eli. 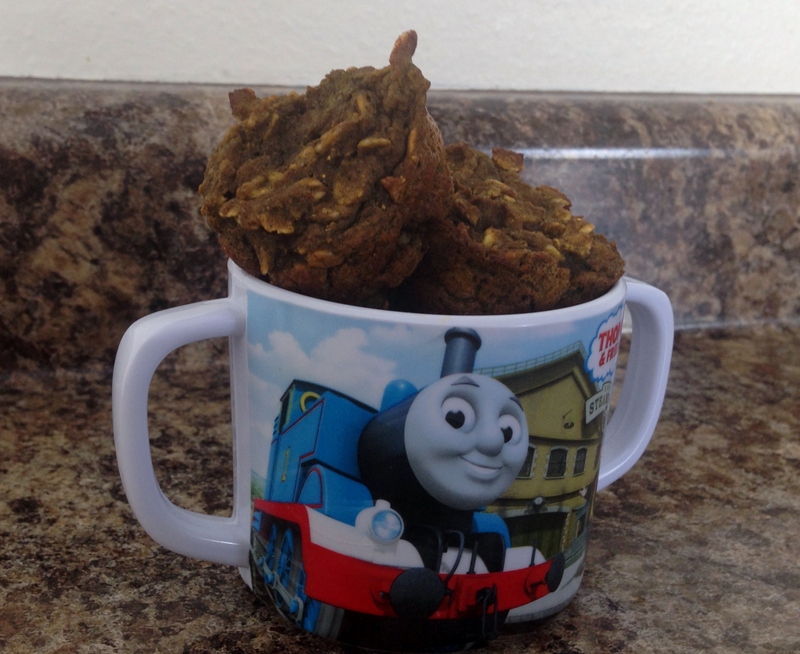 It was bland (which is what you want for infants) and had a strange greenish-brown color, but it didn’t taste much like iron and he loves them. I put them in mini muffin tins, so he is able to handle the whole muffin all by himself. Each one has about 75% of his daily iron needs, so I’m satisfied with not having to force feed him any other iron supplements. I kept 5 out for the week and froze the rest, with the plan of just taking them out when I need them. Mix cereal oats, baking soda, and cinnamon together in a medium bowl. Cream butter and eggs in a large bowl. Mix in pumpkin, applesauce and iron supplement together. Fold in dry ingredients. Spoon batter into each muffin cup. Bake for 20-25 minutes, or until a toothpick comes out clean and the edges are pulling away. – I noticed that these took awhile for the center to be completely done. Be sure the tooth pick comes out clean! If you used instant oats instead of old fashioned you might have better luck – let me know if you try this! – Technically babies aren’t supposed to have eggs until 1 year – use at your own risk. 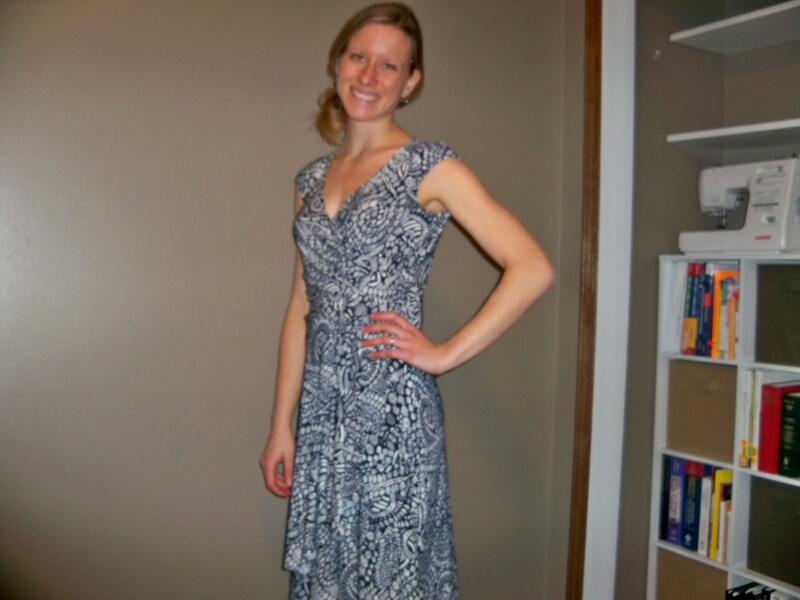 Wow – I can’t believe I haven’t posted for over 6 months! Where has the time gone? Oh yeah, being a mom, wife, and 4th year medical student. I have so much to update but I’ll keep it as short as possible. 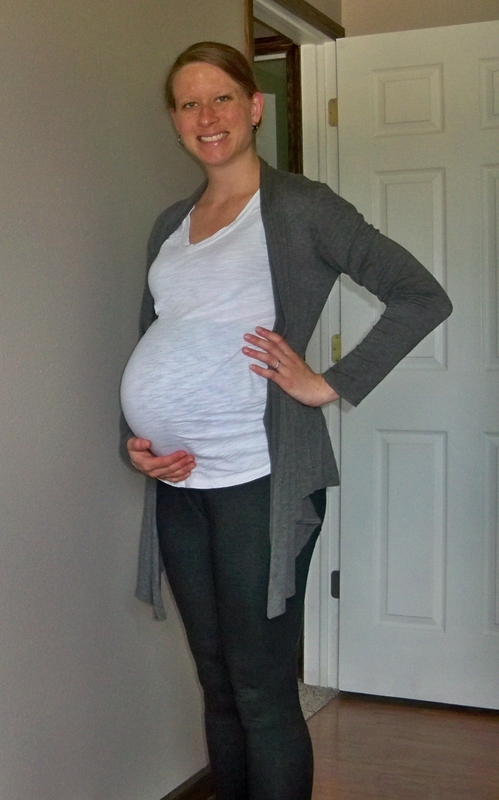 Let me start by saying Eli is absolutely amazing and I truly love being a mom (most days). This wasn’t the case at the beginning and now I am realizing that I’m not alone in that feeling. I didn’t cry when Eli was born or feel an overwhelming sense of love for him the second I saw his face. Don’t get me wrong, I loved him and he was beautiful, but it wasn’t much different than what I felt when I saw another friend’s beautiful new baby. I wondered when this would change and honestly, it was probably around 3 or 4 months when he really started to be interactive. The first few months were OK. I was tired from never sleeping more than 2 hours at a stretch, but I was getting the hang of things. I really wanted to go back to work and thought about starting back a few weeks early. I missed the mental stimulation of medical school rotations and needed a break from baby. I decided to hang in there and went back after 10 weeks, as originally planned. Going back was the best thing for our relationship. It made me realize how much I did love him and left me looking forward to our evenings together. As the weeks passed by I became amazed at how much he changed. 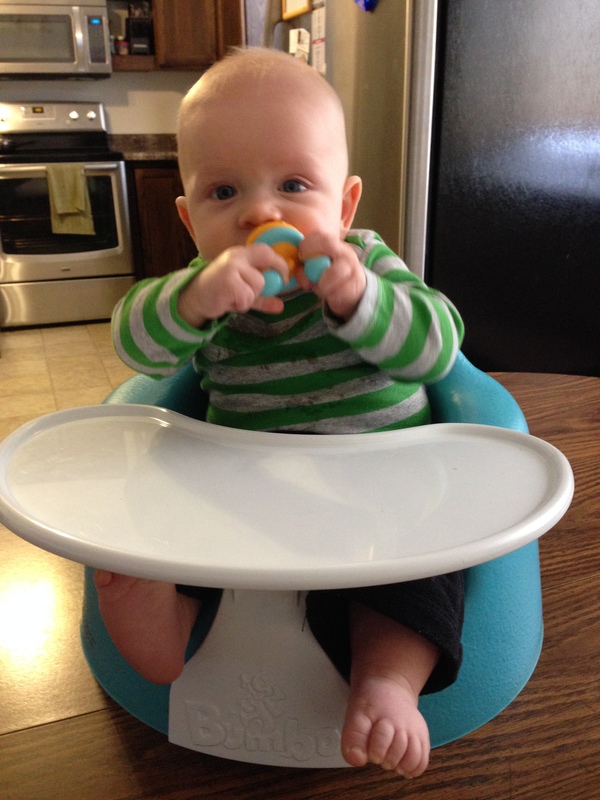 By 3-4 months he was sitting up in a bumbo and grabbing at our food and trying to feed himself. 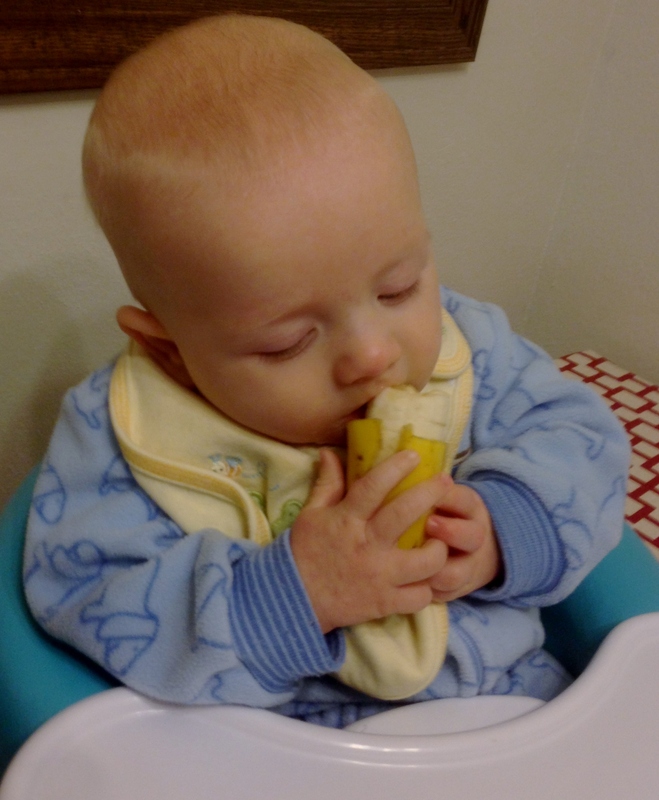 We decided to let him taste a few things around 4 months, even though I originally planned to wait until 6 months. He was developmentally ready, so I reminded myself that books and recommendations are guidelines that need to be tailored to the child, not the other way around. 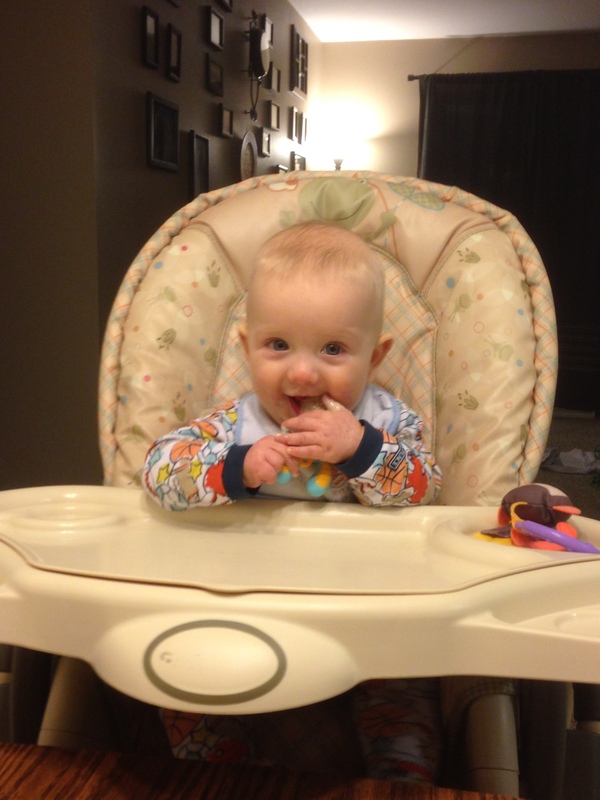 By 5 month he was sitting up unassisted and loving his food feeder. He was babbling up a storm and really turning into a little boy. He took his first flight at 5 months and did OK. By 6 months he was trying to stand on his own (while holding something) and really started to love his solids. By 7 months he was able to pull himself up to stand and was trying to figure out the whole crawling thing (thankfully he hasn’t figured it out yet!). 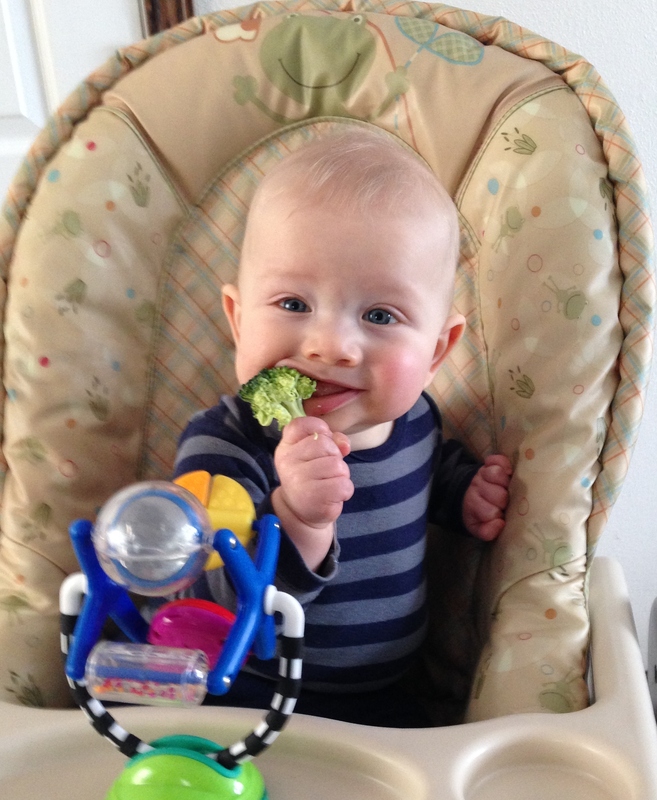 He officially loved food by this point – a lot – and figured out chewing, despite having no teeth yet. 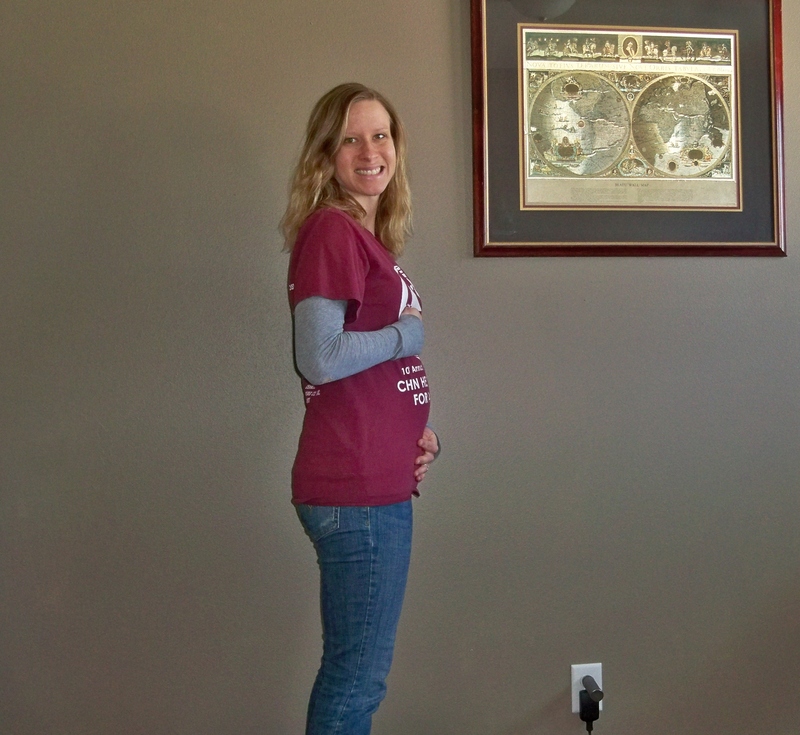 He will be 8 months in a few days and it looks like crawling will likely happen in the next few weeks -eek! He is one of the happiest babies I have ever met and I am so incredibly in love with him. We were able to spend a lot of time together these past few months because I am wrapping up rotations and have some time off. I am so grateful for our time together! 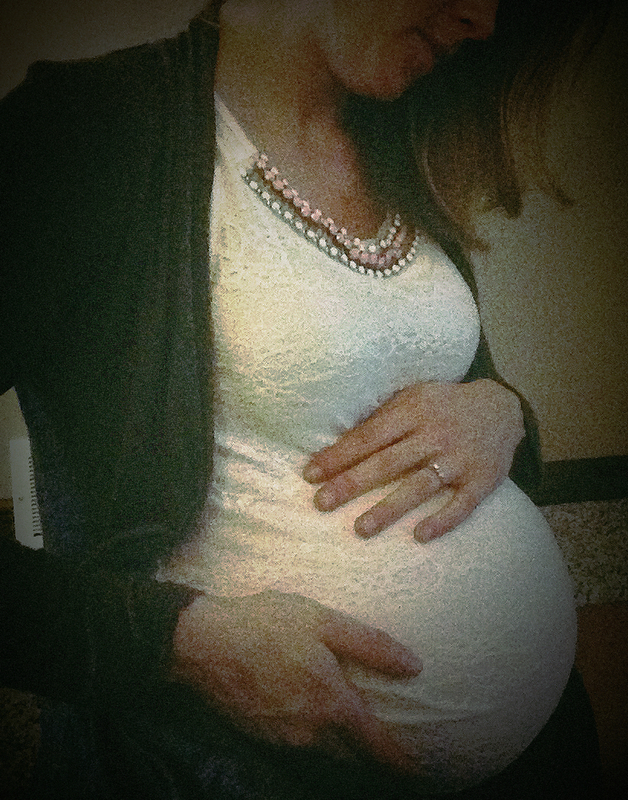 Looking back, I’d rather have started back at work after 6 weeks if it meant I could have 4 more weeks with him now. He finished day care in December and has been home with me, my mom, or J over the past few months. 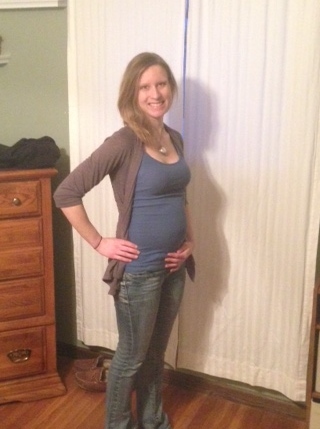 J is going to be a stay-at-home dad starting in April and is so excited about it. He knows it won’t be a walk in the park, but he is looking forward to really getting to bond with Eli. 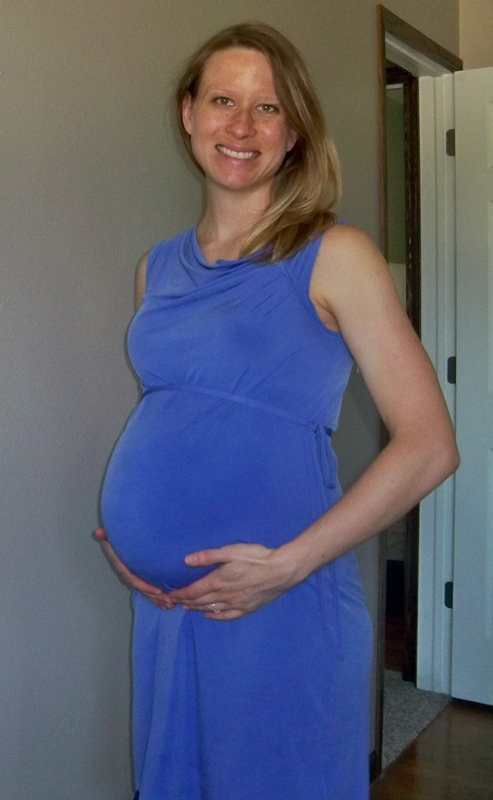 I am so grateful I finished my board exam before Eli was born, because baby brain is for real. Sleep deprivation does some crazy things – one thing in particular is loss of word-finding ability. I can’t begin to count the number of times I couldn’t think of simple, everyday words. Going back to work was an adjustment – if I couldn’t think of the word cardboard how was I going to take care of sick patients with pneumonia?? After a few weeks I got back into the swing of things and it started to improve. Even now I still have trouble recalling things, but I just look it up and study harder. Thankfully the year is wrapping up and I haven’t had many tests. In fact, I just finished my last exam of medical school and only have one 4 week rotation left (for the month of April)! Where has the last 4 years gone?? After med school there is this thing called residency. It’s sorta a big deal. Most of 4th year is spent applying and interviewing for residency. I have decided to go into family medicine with the intention of practicing full spectrum FM (outpatient, inpatient, and deliveries – you know, the way all doctors used to be). These jobs are a little hard to find, which means the residencies are also hard to find. I had specific criteria for what I was looking or and ended up interviewing at 9 programs in Wisconsin and Colorado. I have found my dream program and next week (March 20th) I will find out if they liked me as much as I liked them. The way residency match works is I rank the programs I like and the programs rank all the people they like. Then this fancy computer program looks at all of the lists across the world and puts you in your best possible match. On March 20th, I will open a white envelope at 11am and find out where I will spend the next 3 years. It’s pretty exciting and I can’t wait to find out! Meet the newest addition to our family! Elijah James was born on July 17th at 6:13pm. 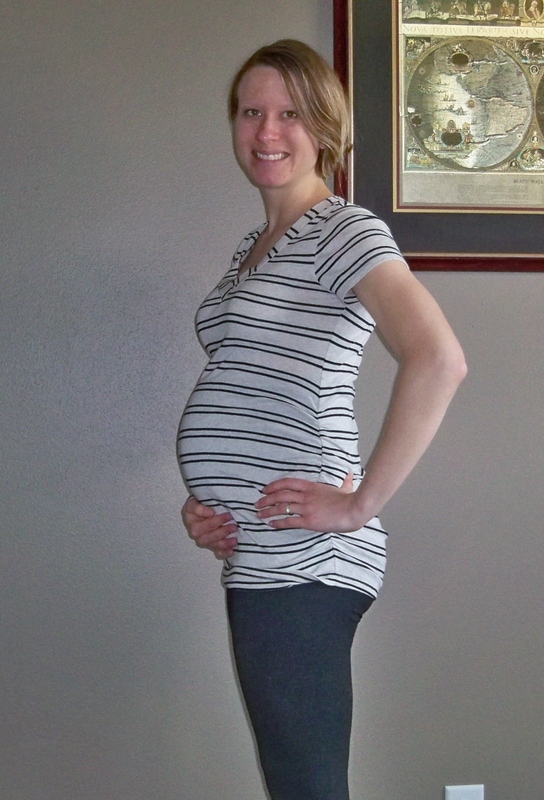 He was 6 pounds 7 ounces and 18.75″ long. 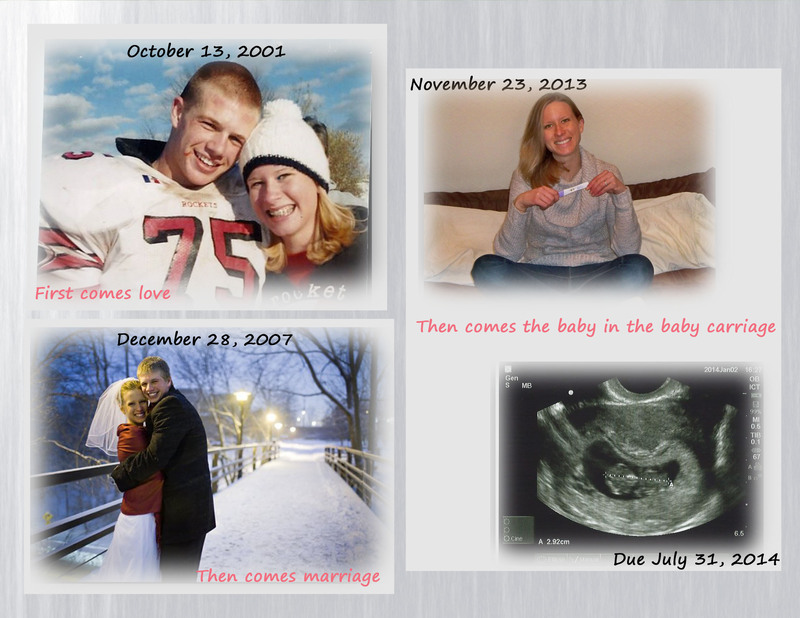 He was 2 weeks early, but that was when he decided he was ready to come. My water broke at 9 am that morning, while I was at work. 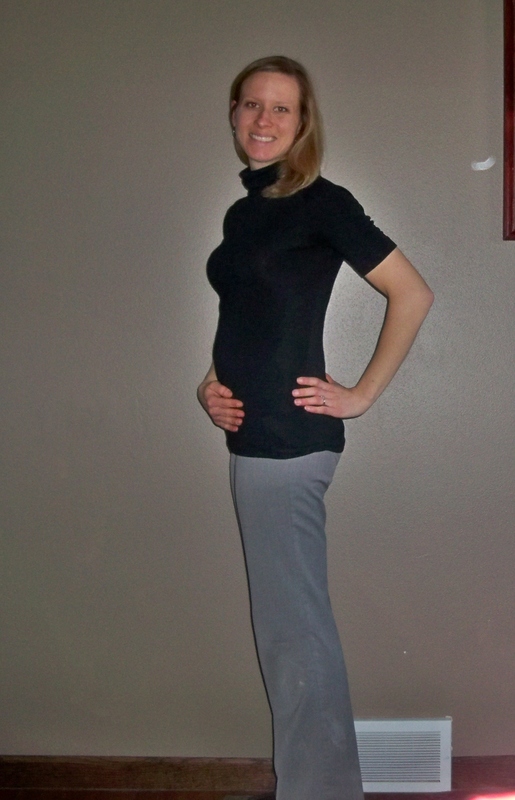 Note to all pregnant women – be sure to wear black pants to work when your due date is approaching! 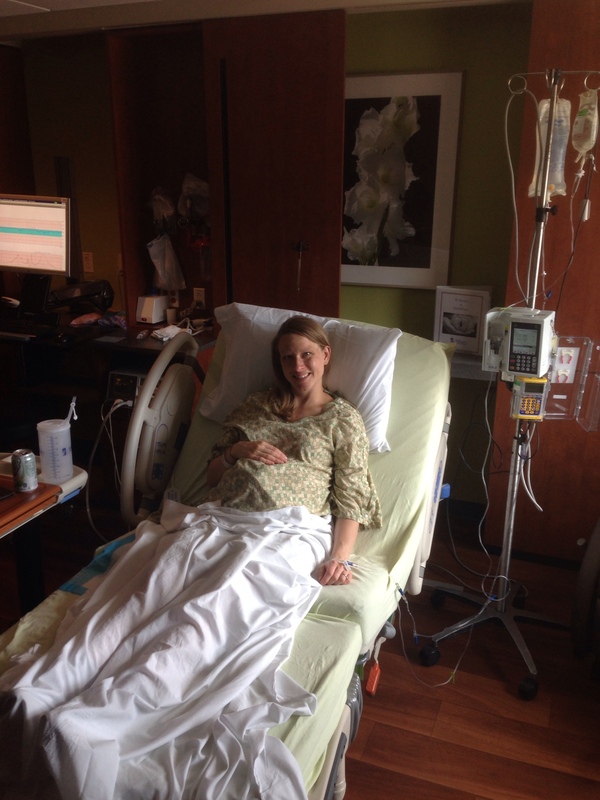 The labor and deliver went smoothly. Honestly, I would do 10 deliveries over 1 pregnancy. I am positive that being physically fit played a role in this. Little Elijah did have a triple nuchal cord, which is very rare (0.5% of all births), but thankfully there were not complications from this after he was given some oxygen. I’m nursing and was very lucky that my milk came in by day 2. 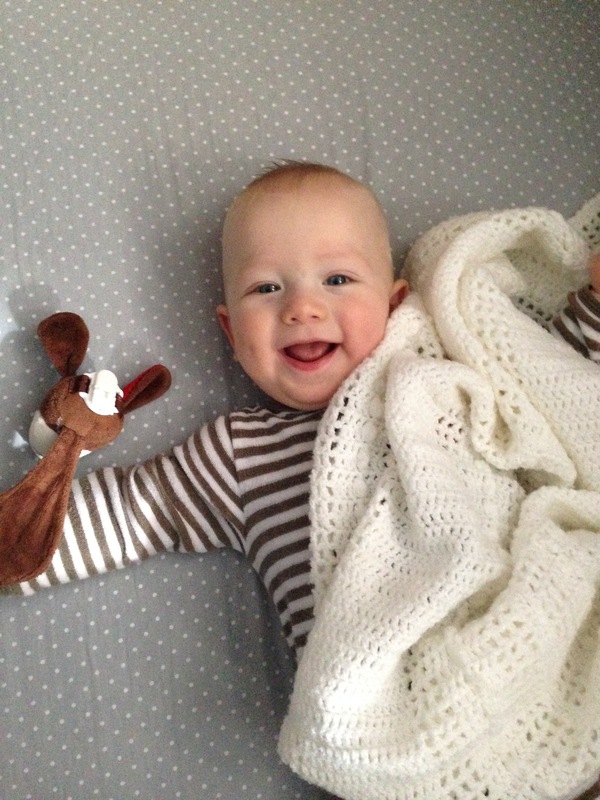 He latched on his first attempt after birth, which is also very lucky. He’s a natural 🙂 We went home after 36 hours and quickly began adjusting the new routine (well, lack there of). Bailey didn’t realize there was a new addition, but Bandit noticed right away. The first day he was extremely jealous and gave us the cold shoulder. Then he realized if he warmed up to Elijah, he’d get more attention to. Now he sleeps under Elijah’s cradle and tries to sit on my lap when I nurse. I think they will become best buds in a few months. During his first week home we had his newborn pictures taken. They turned out great. Feel free to take a look here. He is now 2 weeks old and has been doing great. He had some issues with gas that made him extremely fussy. I thought he was in a lot of pain, but it turns out that he was likely just frustrated that he couldn’t get the gas out. He has been starting to do much better with this. At his 2 week appointment he had already gained 1 pound from his birth weight! 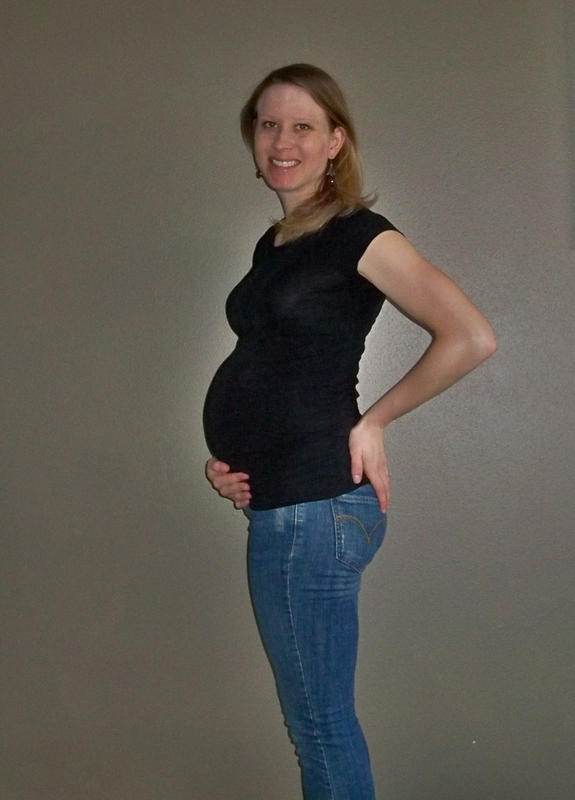 In case you aren’t familiar with baby weight gain goals here is a summary – all babies lose some weight in the hospital b/c the mom’s milk isn’t in yet. Elijah was down to 6 pounds 2 ounces at discharge. Two days later babies go in for a weight and color check (to see if they are jaundiced) with the goal of <10% total weight loss from birth. Our little eating machine had actually gained 1/2 ounce from his discharge weight, so he was on the right track. 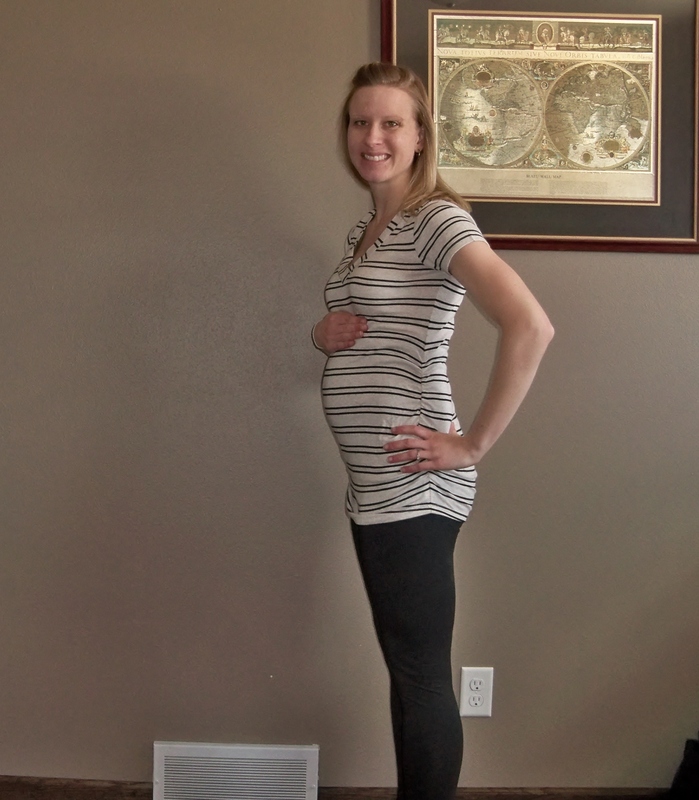 At the 2 week appointment the goal is to be back to birth weight. 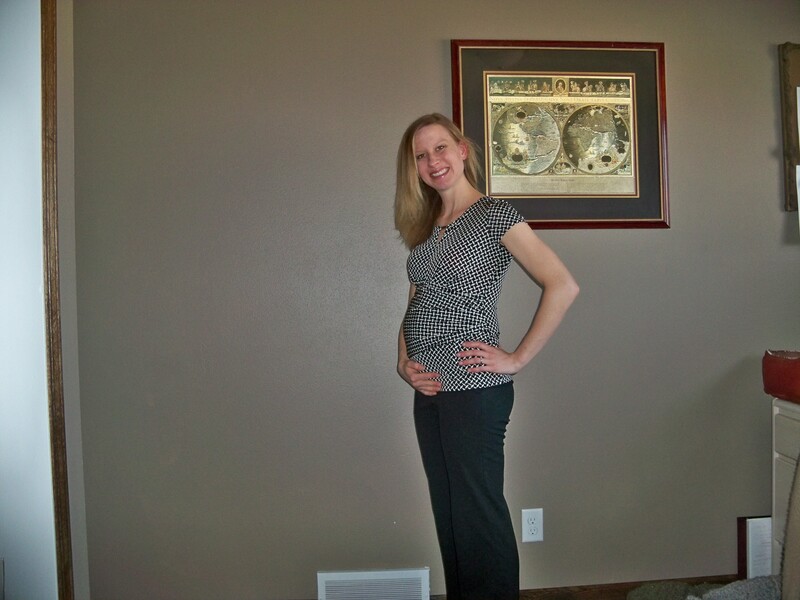 Elijah is already an overachiever and decided to gain not only 5 ounces, but an addition 16 ounces…in just 10 days. Needless to say I feel that all I am doing is nursing and changing dirty diapers, haha. Surprisingly, I have been adjusting well to the lack of sleep. I get 1-2 hours at a time during the night. I usually get 3-4 of these naps in so it is total of 5-6 hours per night. I usually am pretty awake all day but occasionally take a nap sometime after 3pm when I start to crash. 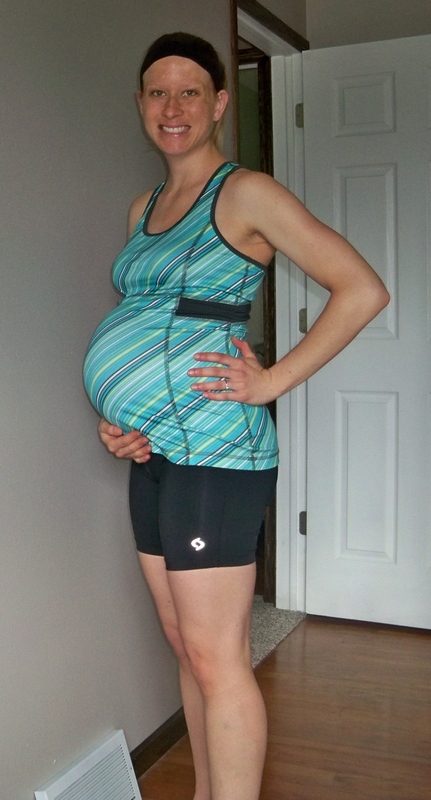 So far so good, but I am sure this will start to wear on me. Let’s hope he is one of those magical babies that sleeps through the night after a month or two. 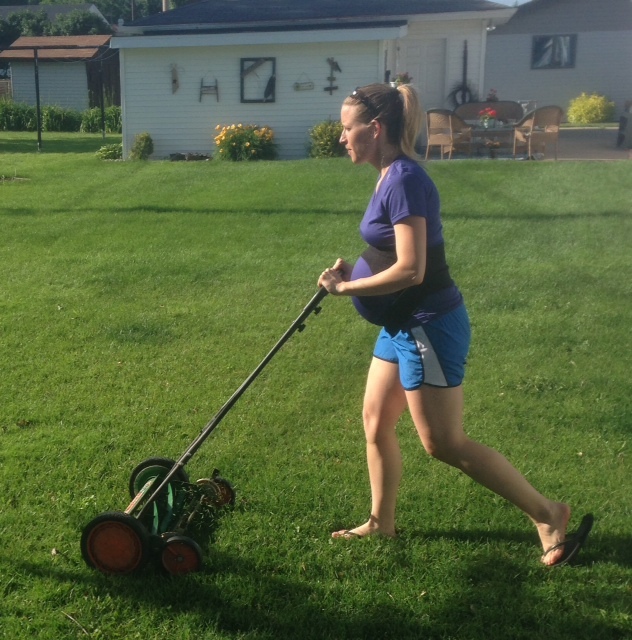 Week 37 – mowing the lawn with the Reel Mower! 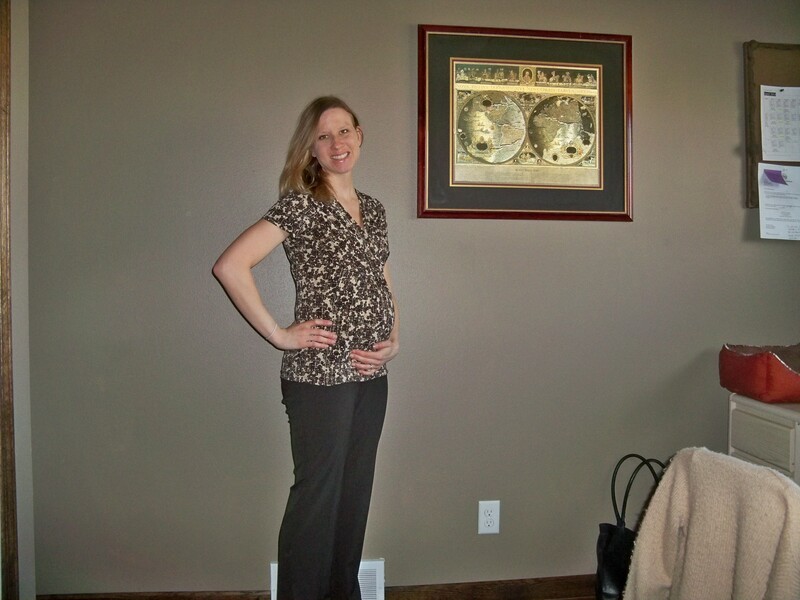 Second trimester has come and gone…2 weeks ago already! I have been busier than ever (hence the lack of posts), but have been feeling well. 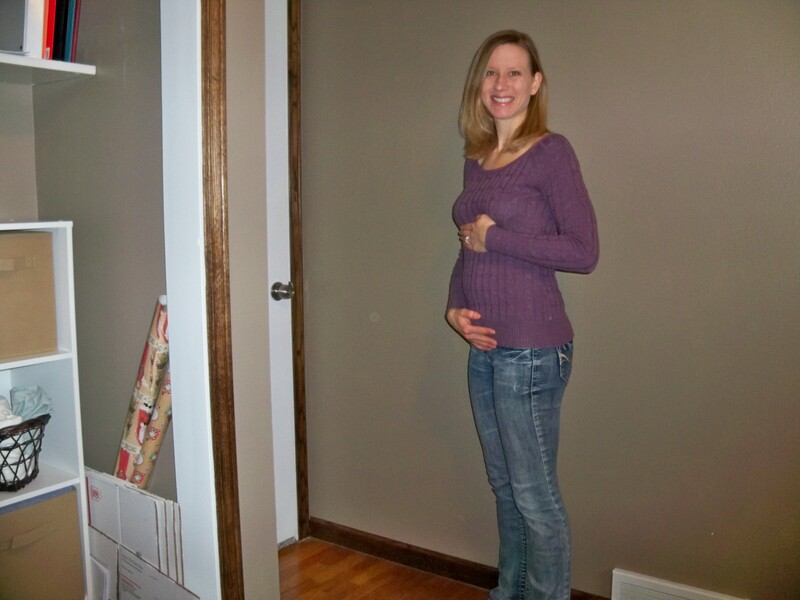 Around 20 weeks the nausea ended – yes! and then returned – no 😦 and then left for the most part – I’ll take it. 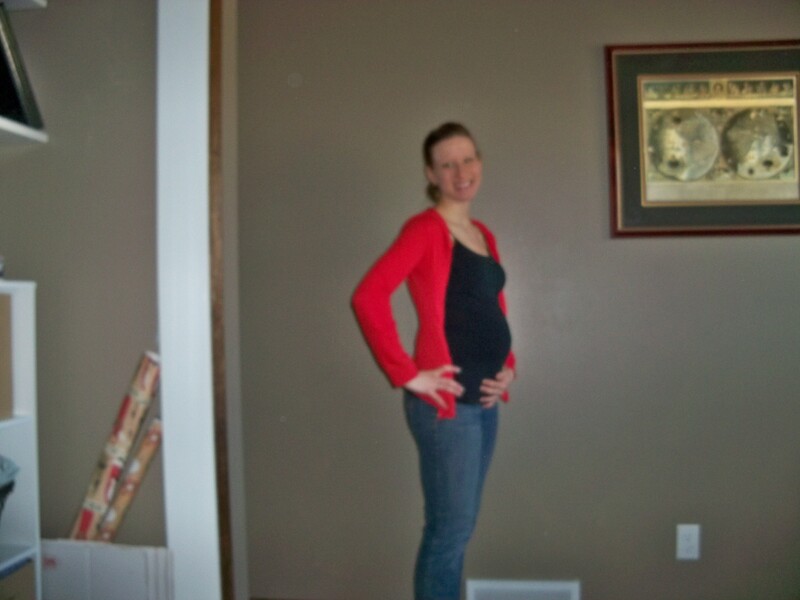 Around week 20 we also found out that we will be having a little boy! We don’t have the name officially picked yet, but we have a few in mind. We are keeping them a secret and will decide once we see him. During 2nd trimester I finished up my stent in family medicine, completed my internal medicine rotation, and started my general surgery rotation. 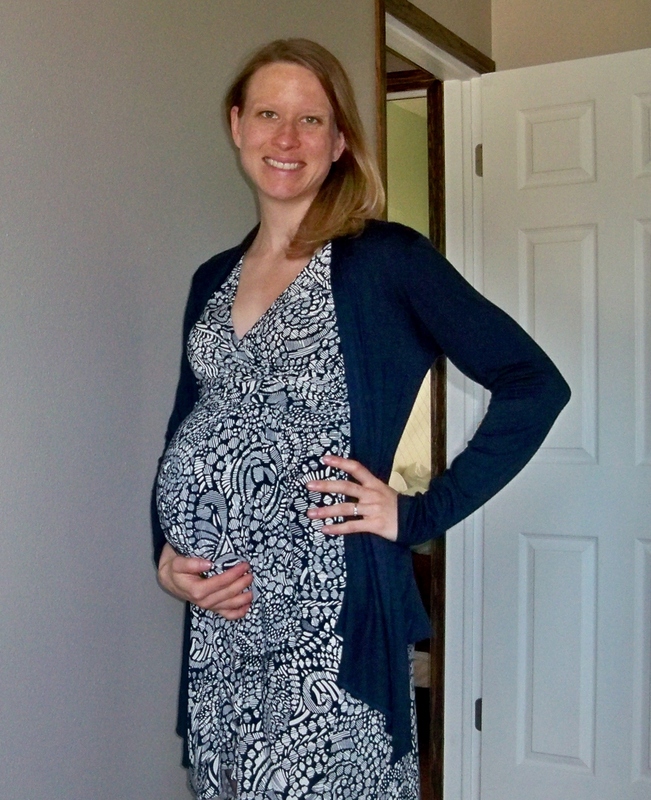 I went from being 99% sure I’d do ob/gyn to considering family medicine to loving internal medicine. Right now I am pretty sure I’ll end up as a hospitalist after doing an internal medicine residency. However, there is still hope for family medicine – I have 4 weeks of family medicine coming up at the end of June, during which time I am hoping I’ll make my final decision. While I loved ob/gyn during the rotation, I think it was just the first rotation that got me excited about being a doctor and not actually what I want to do forever. I am in the middle of my surgery rotation and while it is fun and interesting, I don’t think I want to be a surgeon, so it has made ob/gyn less of desire as well. But, things can change and we’ll see what the next few months bring. I have 4 weeks of surgery left (cardiothoracic and plastic surgery) followed by 4 weeks for family medicine and hopefully 2 weeks off before baby comes. In the next month I have 2 big clinical exams (i.e. standardized patients) and 2 big multiple choice exams (surgery shelf and step 2 CK board exam). I am not sure how I’ll do it, but I’ve realized not worrying about that part makes it much easier – it will all work out in the end and I’ll do what I need to do to get there. 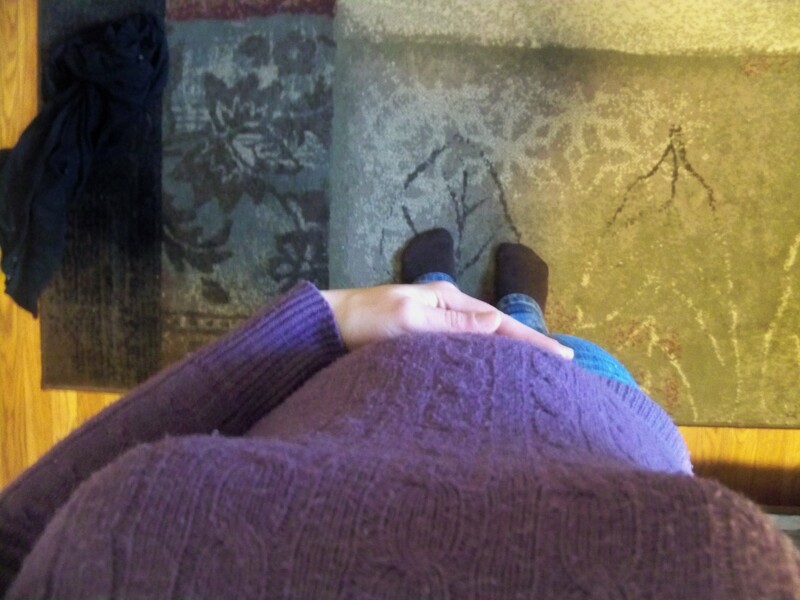 The best part – when baby comes I can spend all of my time with him 🙂 and hopefully it will make the transition to parenthood a little easier. 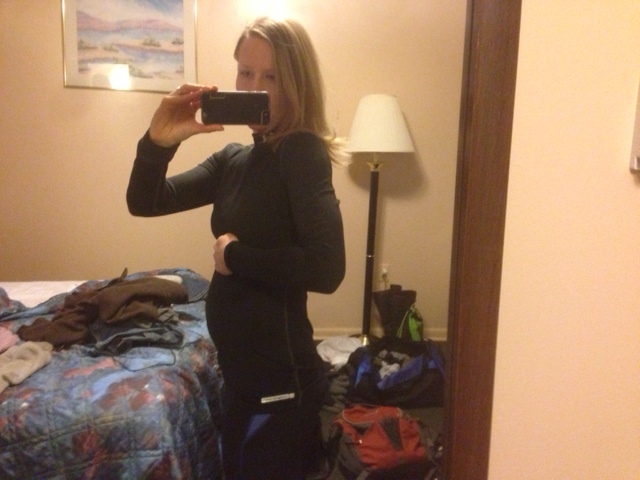 Week 18 – Before we visited the ice caves! 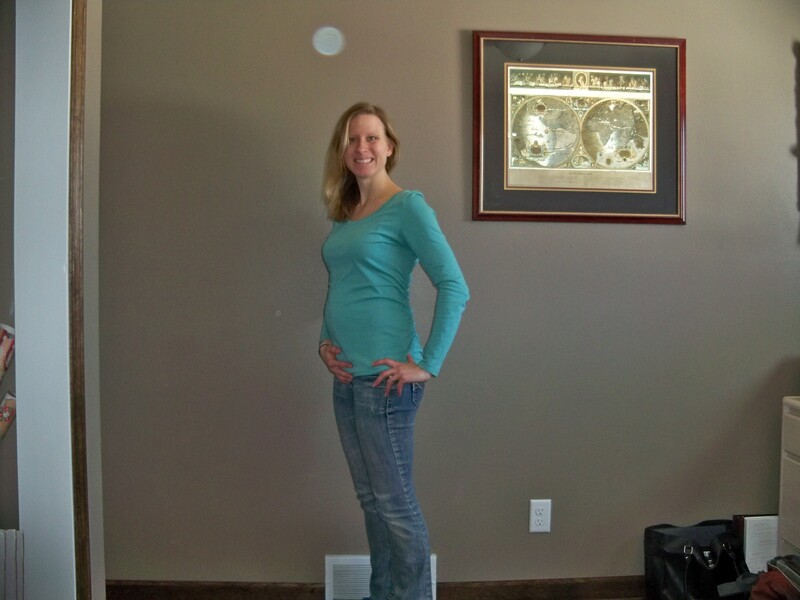 Week 20 – It’s a boy!! 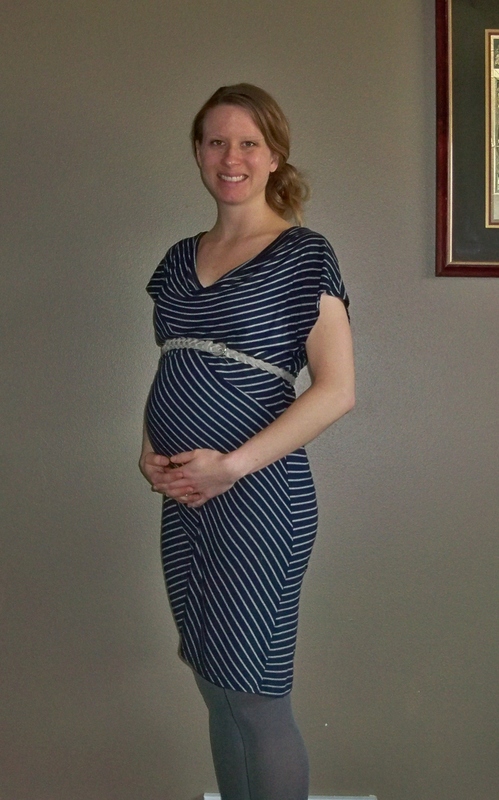 Week 21 – my first maternity outfit! 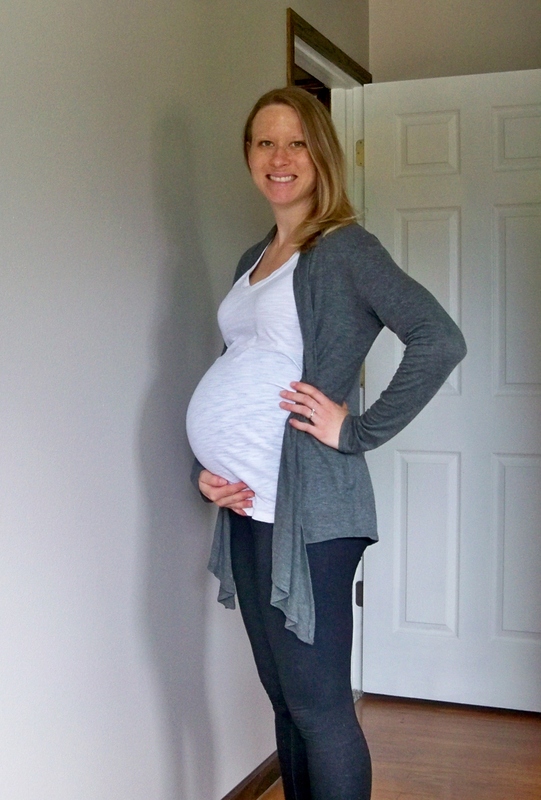 Week 22 – Go Badgers!! A new study published last week found some interesting results – children born via c-section are 26% more likely to be overweight and 22% more likely to be obese. Numerous media outlets reported on the story (here, here, and here). This is not a cause and effect relationship, so if you had a c-section PLEASE don’t worry that you have doomed your child to be overweight or obese. There are many factors that may be the cause of this and the authors even admit the link could be due to confounding variables. While the rate of elective c-sections is up to almost 33% of all births, only 2.5% of these are because the mom requested a c-section. The others are due to medical factors or inpatient providers. 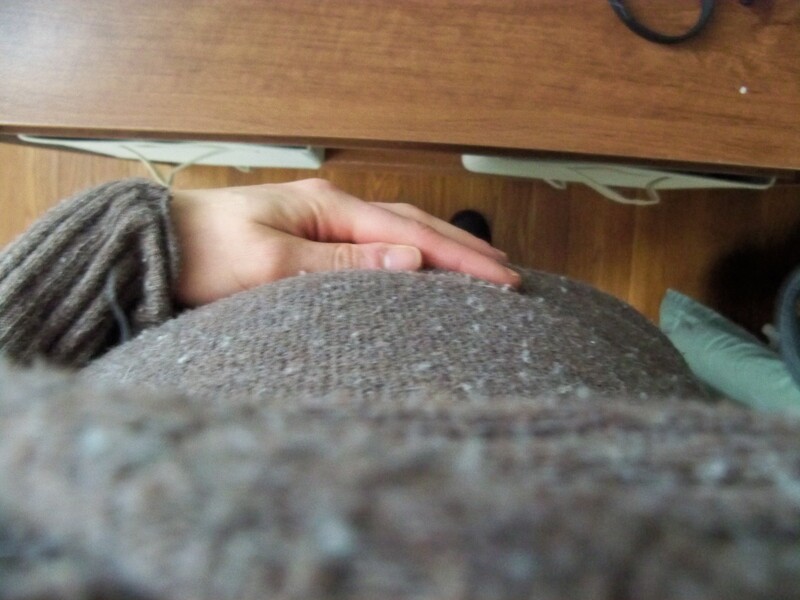 One medical reason that jumps to mind immediately is a large baby. 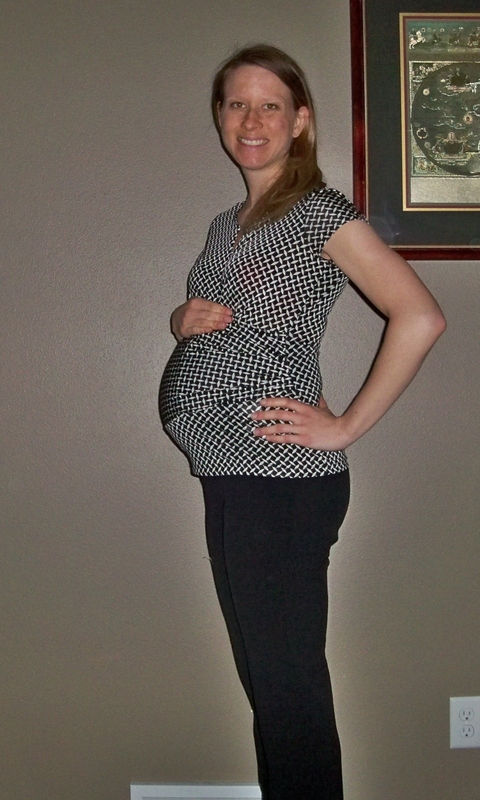 Many of the c-sections I assisted with on my rotation were because the baby wouldn’t fit. Big babies have been shown to have an increased risk of childhood overweight and obesity. For some reason the researchers did not control for birth weight. 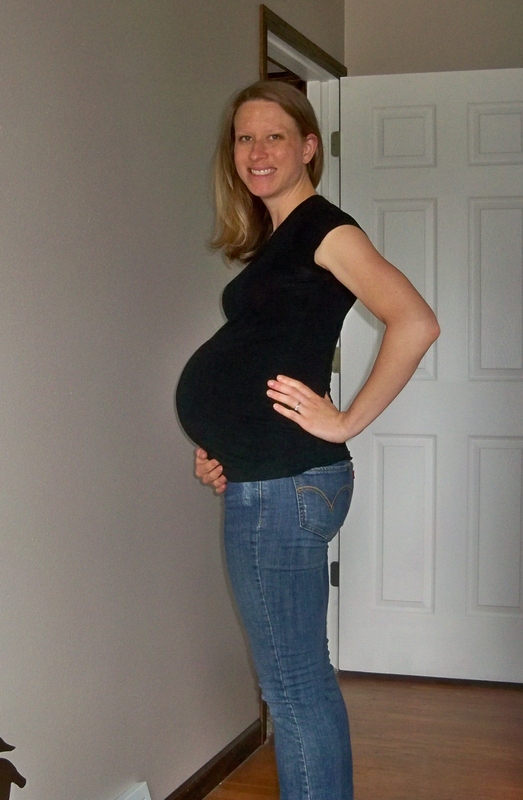 I don’t plan to start scaring my patients by telling them that if they have a c-section their child will be overweight or obese. I honestly think that the findings we are seeing are more closely linked to other variables. The birthing process provides many benefits to mom and baby and it is difficult to know what role is plays in future obesity risk.